HBO’s Game of Thrones is definitely my favorite TV show on the airwaves right now. And it’s probably in my top 10 of favorite TV shows ever. Do you watch it?? You should because it is AMAZING! The sheer production value and scale of it alone is worth a watch. It’s seriously like watching a mini-movie every week! To be honest I am not really a fantasy genre person and was highly skeptical of the show before it premiered last year. But since I generally love everything HBO produces I decided to give it a shot! To my surprise I not only adore it… I NERD out on it! What got me hooked on the show was how grounded in reality it is. There is only a little CGI and the characters are very human. It’s not just a simplistic good vs evil story. It’s more complicated. The way humanity really is. But there is a big plot, tons of characters and locations… it’s a lot to keep straight! So I really enjoy nerding out on HBO.com’s interactive viewer’s guide and reading all the family trees, back-story, and using the interactive maps to delve deeper in the world of the show. YEP, so basically what I’m telling you is the show has made me a complete, total, unapologetic nerd. The only thing I haven’t done yet is read the books… because I don’t want to spoil the show for myself! hehe! Any other Game of Thrones nerds out there? If so, who’s your favorite character? 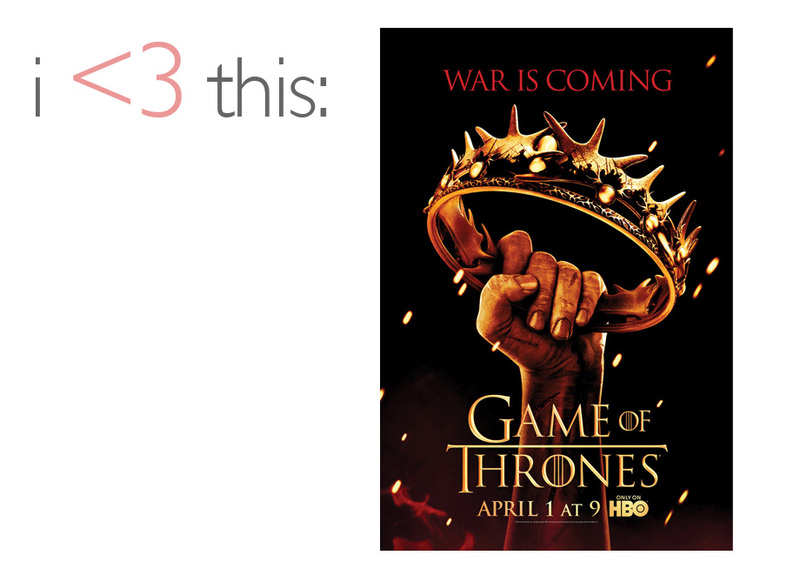 Chelsea Dahm - I am a HUGE game of thrones fan! we love it at our house! That being said, now that Ned Stark is gone (sad day), my favorite characters are Jon Snow and Daenerys Targaryen (Calisi). I will say however, that this season has so far been a little slow and uneventful for me….if we dont count the last 5 minutes of last week!